I’m gonna tell ya, someone needs to make bounce houses large and tough enough so that us big kids can go nuts inside. Bounce houses are the perfect padded room to let your inner nut case out of his cage and let that freak go wild. I’m so jealous of those little fellas who get to play in them. 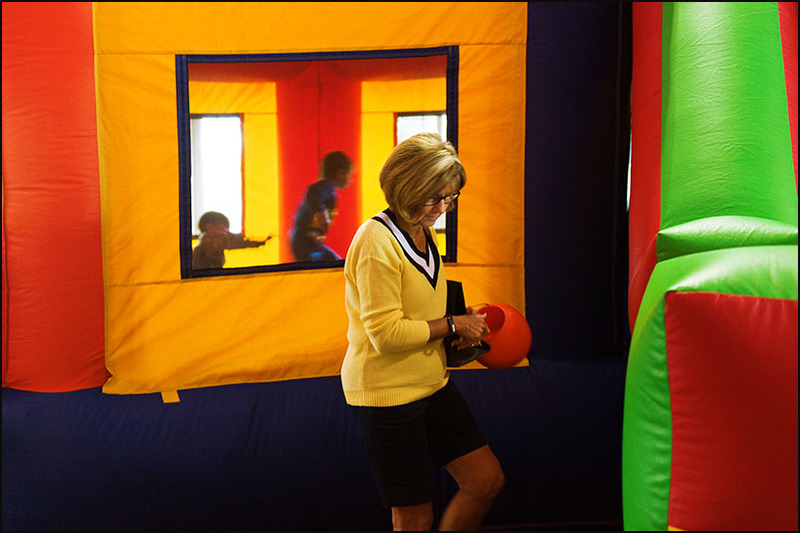 Was at a place with one the other day and got this shot of Ruth, what a perfect grandma name, waiting for her grandson to get properly worn out while safely inside the inflatable color riot. I mean the insane colors, graphics and those two different moments going on: the quiet one that Ruth is having and the behind her that little dude clearly intent on mayhem. Love it. This was a classic case of: find the rough composition where you know that something is going to happen and then wait for the pieces to fall into place.